Padova Urbs Picta. 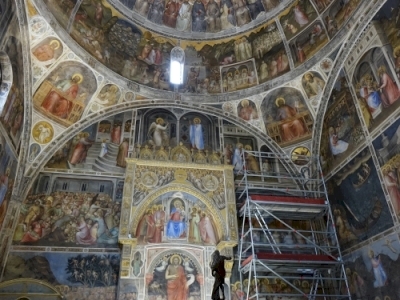 Giotto, the Scrovegni Chapel and the 14th century painting cycles is part of the Tentative list of Italy in order to qualify for inclusion in the World Heritage List. There is broad agreement among the reviewers on this website that the Scrovegni Chapel deserves a place on the World Heritage List and I can only emphasize once again the magnificence of these paintings. The Scrovegni Chapel was on the Italian tentative list as a single monument since the late 1990s, but it was never nominated. Recent activities suggest that things now get going: in January 2016, the T-list entry has been extended to include eight additional sites with frescoes from the 14th century, and it was reported that Padua is working on the nomination dossier and a management plan. The Scrovegni Chapel is still the focus of the nomination: "It represents the most significant monument in the proposed series and the best-preserved fresco painting by Giotto” (cited from the T-list entry). Giotto di Bondone is the most famous artist of the Trecento (i.e. art and architecture of the 14th century in Italy) and an important forerunner of Renaissance. He introduced visual perspective in painting, his frescoes have spatial depth by the use of landscapes and architectural elements in the background, his characters are not static and flat, they show gestures and posture and individuality, Giotto "painted from life". The other sites of this serial nomination show frescoes by Giotto’s lesser-known successors. This website provides detailed information on the nine sites: locations, opening times, descriptions of the artworks and even audioguide tracks. I visited the Scrovegni Chapel for the first time in 2004, and a weekend in Padua in August 2016 gave me the opportunity to visit also the other sites (only the Cappella della Reggia Carrarese was closed). The Scrovegni Chapel is definitely the highlight. The entrance is via the Musei Civici agli Eremitani, I would recommend to pre-book tickets online. A visit takes about 30 minutes, it starts with an introductory film and then you can visit the chapel for 15 minutes in a group of 25 people. This restriction is an appropriate way to manage the rush of visitors, it allows to admire all the details and colouring of the magnificent frescoes without jostling. To my surprise, it was allowed to take photos, this was not the case ten years ago, if I remember correctly, and is forbidden in several of the other sites. Musei Civici agli Eremitani (admission is included in the fee for the chapel): works of Trecento artists are shown in two rooms, including a painted cross by Giotto. I was most impressed by the cycle of angel panels by Guariento. It has been discussed in the forum, whether "movable" and "detached" objects can be part of a WHS or not, see here. Chiesa agli Eremitani: next to the museum, with frescoes in the apsis, partly damaged in WWII, free entry. Battistero della Cattedrale: another highlight, entirely decorated with wonderful frescoes by Menabuoi, most notable are the paintings in the dome, no photos allowed. Palazzo della Ragione: in the centre of Padua, with a striking roof construction and a huge hall in the upper floor; however, the dimensions of the hall (80 metres in length) are more impressive than the paintings. The Basilica of Saint Anthony is a very popular pilgrimage site because of the tomb of Saint Anthony of Padua, so the frescoes are of minor importance for most visitors. There are numerous services throughout the day, but only the chancel and the central nave are closed to normal visitors. Most impressive: the Belludi Chapel with frescoes by Menabuoi. Oratorio di San Giorgio: next to the basilica, entirely covered with frescoes by Altichiero da Zevio and one of the best sites of this nomination. Oratorio di San Michele: on the outskirts of the old town, the frescoe cycle is partly fragmented, in my opinion the least impressive part of the nomination. Finally, the question: Has the proposal been strengthened by the extension to a serial nomination? In general, I am more in favour of single monuments than of comprehensive thematic approaches, also in this case. The outstanding value of the Scrovegni Chapel is indisputable and as a single monument it would be a representative example of the Trecento on the WH list. Having said that, I must admit that some of the other parts of the nomination are also extraordinary works of art and well worth a visit, especially the Oratorio di San Giorgio and the Battistero della Cattedrale. And if the extension increases the chances for the Scrovegni Chapel to get inscribed, I would have no objections. The fact that this site is still on the tentative list is really a mortal sin! How can such a magnificent site be left out of the WHS list!!! This is truly Padova's highlight. It is a masterpiece - nothing more to add! This site deserves to be added to the list. More than what the rest of Italy--Venice, Florence, Rome, the whole lot--can claim, it was this building that kick-started the European Renaissance and thus the modern world as we know it. It is also incredibly beautiful to boot. Along with the Orto Botanico, the Capella degli Ermani really shows that during its height Padova and its university was one of the most important centers of learning in the western world. This was the single highlight of my trip around the Veneto, and the finest site I have visited from the tentative list. It could easily make it onto the World Heritage list proper and I really hope it does. 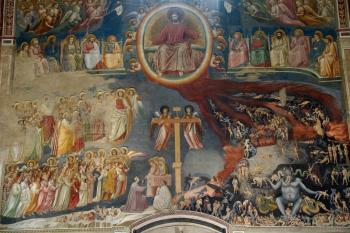 The chapel is famous for its magnificent frescos painted by Giotto. There was something about the amazing misty colours of the interior that really grabbed my attention and held it. The 15 minutes or so we were in this small chapel enabled us to follow the story being depicted on the wall very closely, and gave plenty of time to really absorb the details of the art works, looking at the incredible emotion that Giotto was able to get into the depictions. This chapel is one of the key works of art from a major turning point in the western tradition; it shows the transition from gothic art to the more natural forms associated with the renaissance. Entry to the chapel is restricted and you will have to book in advance (at least 3 days before but I would recommend booking as early as possible especially if you come in the high season). This limited entry means that a maximum of 25 people are allowed in the chapel at a time, which makes for an exceptionally rewarding way to see the paintings, allowing you time and space to really appreciate them (if only somewhere like the Sistine Chapel could give you the time and space to admire the artworks). Before entering you watch a 10 minute video in a small chamber to help regulate the environment inside the chapel. 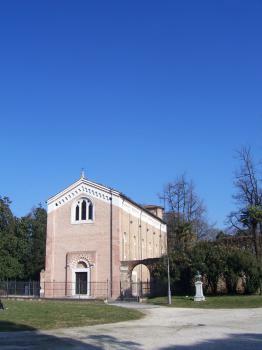 The chapel is located a pretty near to the station in Padua, and really should be the main purpose for visiting the city, even over the already inscribed Orto Botanico. After exiting I had to take a little while to just reflect on what I saw, it stands alongside Skellig Michael and the Plantin Moretus Museum as one of the most impressive sites I have seen. These small and manageable places manage to squeeze a lot into small places and they really had a major effect on me. This is a truly World Class site and one that the World Heritage list is poorer for not including at the moment. I really hope this is added at some stage in the future. I went to Padua especially to see this marvelous Giotto capella and it was even more striking than I had expected. Giotto was indeed a genious. Padua by the way was heavily bombarded in WWII so many other sites including the nearby Capella degli Eremitani covered with frescoes by Mantegna were damaged. Nonetheless, the huge dining room (the largest in the world), Scuola San Giorgio, San Antonio complex, Prato della Valle, the Univeristy del Po' and the Battistero all offer the art lover great pleasures. Weren't it in Italy I'm sure a town like Padua would become a prominent tourist attraction and a country's main source of pride!